Fancy desserts and, of course, chocolates, are nothing but plentiful during the Valentine’s Day season. It’s easy to vilify chocolate and when you’re eating it in unlimited amounts as it can block your progress regarding achieving your nutrition goals. Unhealthy fat, plus the processing of cocoa and additives in many chocolate items will eclipse any positive effects. 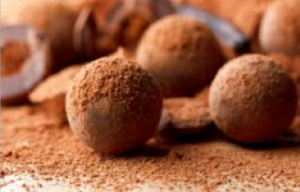 But when eaten in moderation, cacao flavanols, which are found in cocoa and chocolate, boast ample nutritional benefits like antioxidant qualities, lowering blood pressure, preventing blood clots and even improving blood flow to the heart and brain. Here, some ways to combine healthy cacao flavanols into meals and desserts for a heart-healthy bite you can feel good about! The first thing to keep in mind is to choose a high quality dark chocolate made with at least 70% cacao and unsweetened cocoa powder that has not undergone Dutch processing, which is non-alkaline. For a morning kick, you can do this by adding cacao nibs to oatmeal or sprinkling some cacao powder to your coffee grinds. Chicken mole is an example of a savory meal in which a little cacao is welcome. Check out Keri Glassman’s recipe here. If you’re craving something sweet, cacao is great in our chocolate almond butter banana muffins or dark chocolate truffles. We also recommend our delicious chocolate avocado pudding, which is super simple to make. As always, keep portion sizes in mind when serving. Blend all ingredients in blender or food processor until smooth. Divide into 2 bowls and refrigerate for 2 hours. Garnish with 1/4 teaspoon unsweetened coconut flakes.